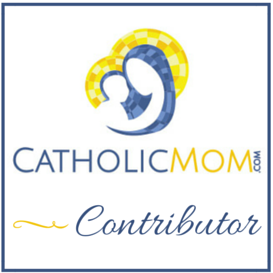 Welcome back to the Grace of Yes book club, hosted by CatholicMom.com. Chime in on your blog or head over to the main page for the book club for a great discussion about Lisa Hendey’s latest book. Pondering Lewis’s simple quote can help us see how to reconcile the legitimate need to promote something w have created with the desire to never be self-centered. Whether you are an author or a plumber, a lawyer or a farmer, it’s likely that if you labor at something, you will need to be involved in advertising your work to others, in simply calling attention to what you have accomplished. It occurs to me time and time again that there are appropriate ways for people of faith to do this and still live generously. First and foremost, we must be utterly convinced that the gifts we have to share with the world come from God. If we are seeking an example of humility in action, we need only look at Mary, the mother of Jesus Christ, who gave all the glory to God when her cousin Elizabeth recognized the Savior of the world dwelling within Mary’s womb. Her canticle in the first chapter of Luke’s gospel is a song of true humility (see Lk 1:46-55). Lisa talks about humility in action, in our own times. I might be tempted to despair that this is too difficult to find, but I’d only be fooling myself with that kind of talk. There are plenty of people whose humility is a shining example in our world, but to find them we must seek them out. Their example is a quiet one in a noisy world, and maybe practicing a little silence on our own part will help us see them more easily. Lisa specifically talks about Matt Maher’s performance at World Youth Day in Rio de Janeiro in July 2013. This video brings tears to my eyes, and the song itself calls me to the humility that I really desire — but am afraid to reach for and achieve. Forgiveness is another hallmark of humility, and it’s one of the hardest to put into action. Lisa rightly points out that forgiving others is not the only path of forgiveness we must take; we must also forgive ourselves. While I’ve been working on learning to forgive others and not to hold on to anger I might have against them, I know that one of the hardest things to do is to forgive myself for my own sins and failings. I’ve told the story about how difficult it is for me to forgive myself for the tubal ligation I had 13 years ago. No matter how much I remind myself how truly frightened I was at the prospect of being pregnant again and suffering so intensely, no matter how often I remind myself that Jesus truly forgave me and even gave me a wonderful sign of that forgiveness, I occasionally feel the weight of my guilt when I think about it. When my Facebook feed fills with pregnancy updates and baby pictures and Baptism pictures, sometimes my heart just wants to break in two. The pain I feel over my decision weighs me down and I just want to cry in sorrow for what I did. Well-meaning friends might try to excuse me, but I know in my heart that what I did offended God and went against His plan. I know there were other ways I could have avoided getting pregnant without resorting to artificial means that broke my relationship with God through a mortal sin. And when the feelings come to me — which happens less and less often — I remember what I heard in Confession that day: God has forgiven me. The devil is the one who wants me to believe it’s not possible that happened, and I can’t listen to him. I must listen to the God who loves me and trust that He has forgiven me. I must give the burden over to Jesus, let Him carry it for me. And He will. He’ll do it because He loves me. He loves me even more than I love myself. ° What does true humility look like in you? Do you struggle with being humble? How so? Living by this kind of a creed doesn’t mean you’re not important, but just that you’re following C.S. Lewis’s advice and thinking of yourself less. Putting God first and others before myself simply means that if my children need extra help with an independent assignment for school, that needs to come before my blog post. It means if my husband needs me to help him out by ironing his shirts (which he usually does himself), that gets done before I sit down to read another chapter in my book. It means if I’ve committed to teaching Sunday school, planning the lesson comes before I catch up on watching Agents of S.H.I.E.L.D. But humility means that I’ve put my family’s needs first, that I’m willing (and happy!) to sacrifice some “me time” for their benefit. That I’m glad to drive back and forth across town for soccer and dance and play rehearsals and the rest, and I don’t complain while I do it. ° How does your daily work impact your humility? If I’m living out my first vocation well — wife, mother, homeschooler — I believe it has a tremendous effect on my humility. I’m firmly convinced that homeschooling my children is the primary way that God is sanctifying me. To get their work done, I have to put their needs before my own desires. I can’t sit and read blogs and articles online all day, or lock myself in a room and read for hours at a time. I must stop my own pleasurable pursuits to educate my girls. This isn’t some kind of evil, as Western society seems to think it is, but a chance for me to grow in holiness. It’s a chance to learn to control my passions and desires and submit them to a greater good. This wasn’t apparent to me until my older daughter started middle school, and her course-load started getting more demanding and her ADD interfered with her ability to learn. Before that, homeschooling was fun! We had arts & crafts and day-trips to the duck pond, we could finish work in a couple of hours and have the afternoons to play and have fun! But middle and high school are different, even for homeschoolers. The curriculum we’re using for high school is an excellent one; it’s a lot like sending her to a private prep school in terms of the level of difficulty of her courses. But this means that we both have to buckle down and work hard — I have to make sure I teach her well so she grasps the material, and she has to make sure she studies hard so she can pass exams. And this leaves less time for me to pursue my own interests. If I take on too much, something has to suffer. That something should not be my family.